Portus Apostoli, the project was born to vindicate Noia as a port of Compostela and listed among the official itineraries Camino Santiago, received yesterday a major boost from its neighbors. About 300 people arrived yesterday at the Plaza del Obradoiro after making 45 kilometer route. One hundred completed the Camino walk from Noia, leaving early, while others performed the journey by bus and other means of transport such as quads. The aim of this organized arrival at the foot of the Cathedral of Santiago, is claim their compostela walk by recognizing Noia as an official pilgrimage route to Santiago. 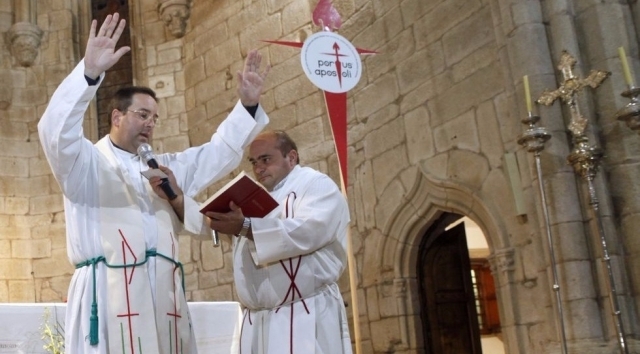 An initiative also supported the pastor Jose Ortoño, the church of San Martino and the city of Noia, who are behind the initiative. When the pilgrims arrived at the Plaza, they unfurled a banner of Portus Apostoli to make it clear your claim.The pastor Jose Ortoño not rule out repeat the initiative in the future, due to the great acceptance and participation of residents. Santiago Freire, Mayor of Noia, could not make the walk way by their commitments, but would dismiss the neighbors in Noia and receive in Santiago, praising his commitment to the initiative.